Stash Busting – My "Round Tuit"
So I had a little bit of yarn left over once I’d finished the Hideaway Hooded Scarf that I mentioned in my previous post, and I’ve been wanting to attempt a cuff “bracelet” of some description for a while now . . . My Googling (from tangent to tangent as you do) brought me to Susan Lombardo’s post about Hyperbolic Freeform Crochet Sculpture. 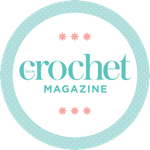 Freeform crochet is something that’s been on my radar for a few years now, that I have really loved the look of, but never really known where to start with. So I followed Susan’s fabulous instructions and ended up with some really cool curly crochet that looked amazing with the leftover yarn I have pictured above. Then I realised that if I rolled the curls up really tightly, they kind of look like flowers. I had a bit of a fiddle around with how that might work (sorry – no pictures. I had no idea I was going to like this so much!!) I still hadn’t quite finished off this ball of yarn so I hit my pattern stash again and found this one that I’ve used before for the full yummy wrist warmers. This time though, I wanted to have a “cuff” that would slip over a hand and sit on the wrist nicely – I thought the ribs in this pattern would create just the right amount of stretch. As it turns out – I had just exactly the right amount of yarn left to create the cuff and I just carried on with beginning the cuff from the end of the freeform and crocheted the ends of the cuff together when I had just about finished the yarn (I hate weaving in ends 😱). Next step – attaching the freeform to the cuff so that it holds the shape I wanted: So I rolled each curly part up nice and tight, then stabbed through it with a yarn needle a couple of times then moved on to the next bit. (Again – sorry, no photos of the process). So what do you think of the end result? I’m calling it a crochet corsage. Oh – and the Hideaway Hooded Scarf? Yeah, I didn’t love it so much. I definitely think I’d like to have another go with the yarn the designer intended! Profile view of the hooded scarf. I’ve double-wrapped the cowl part around my neck. I love the yarn – and the pattern, but not together methinks. To frog or not to frog, that is the question. Oh how wonderful! I love your trick of rolling the curls tight to look like flowers. Thank you for sharing! Thanks so much for the inspiration Susan.